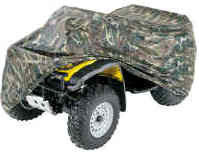 Nylon ATV storage cover doubles as camouflage concealment when you are out hunting - also available in black. One size fits all ATVs to ground level. Polyurethane coated nylon is water repellent. Heavy duty elastic closure cord makes a secure fit along the bottom. 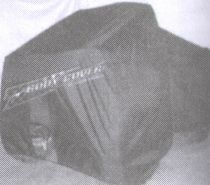 Storage bag for cover is sewn right to cover. Rugged all-weather protection for 3 or 4 wheel ATVs. Polyurethane coated nylon material. Elastic cord sewn in bottom hem for a tight custom fit. Storage bag and tie down rope included. 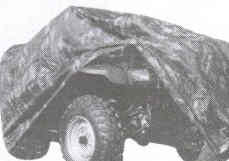 ATV Travel cover, from Sheer Madness, is the only cover offering full machine protection while on the trailer. Reinforced in all stress areas. Open in the front for tie downs and for use with a winch or even while a plow is attached. Water and UV resistant. This heavy duty yellow poly tow strap is rated at 5000 pounds tensile strength. It has a loop at each end and is designed specifically for towing quads. A zinc-plated steel shackle is provided for easy and secure hook-ups. Stow it in the convenient mesh bag. The ATV utility rope is perfect for hunting, fishing and camping trips. Use to haul equipment or hold items on the racks. 12' length with a metal hook on one end.